If you’re living on one income and need to find ways to save, then you’re in the right place. It’s my passion to encourage women to live a frugal and simple life especially stay-at-home moms because I feel our society has failed to equip them with the skills they need to be frugal and thrive on one income. So I’m here to share with you 15 Easy Ways to Save Money As a Stay-at-Home Mom and give you confidence on your frugal journey. If you’re living without a budget, then I can almost guarantee that you’re wasting money. A budget gives every dollar a place to go (house payment, savings, groceries, etc.) and puts you in complete control over your money. So sit down with your spouse and create one now. If you’re unclear about where to start then check out DaveRamsey.com for resources and information. Studies show that people who pay with cash spend less than those who use a card. Handing over cash and actually seeing it disappear makes a bigger impression than just swiping a card. After you’ve set a budget, then you can add up how much you need to withdraw for the week and divvy it up into envelopes. Once it’s gone, it’s gone. Also, leave your cards in the car and only bring the allotted amount of cash into the store with you. This will guarantee that you stay within your budget. Most Americans live paycheck to paycheck and wonder why they never have any money left over at the end of the month. The answer is that they’re spending more than they make. Financially savvy people don’t do this, they spend less than they make. When you set your budget, make sure you’re able to put money into savings. If you can’t then you need to seriously consider cutting expenses or increasing income. Also, when your household receives a raise then you should consider having it automatically put into savings or retirement instead of spending it. If you want to save as much as you can by being a stay-at-home mom then you will actually need to stay at home. Going out uses gas which costs money. Also, if you have a habit of shopping as a hobby, get a new one that doesn’t cost so much such as reading or cooking. Staying home is a great way to keep more money in your wallet where it belongs. Convenience food is nice, but it costs more money. Almost anything can be made at home for a fraction of the cost and is normally going to be better for you and your family. Freezer cooking is also a great way to keep convenience food on hand without going over budget. Eating out is a huge budget drainer, especially if you have a growing family. I know it’s a hard habit to break, but try to menu plan and keep snacks in your car for when you are caught out longer than expected. See 6 Tips to Avoid Eating Out for more inspiration. Also, learn how to make your favorite restaurant meals at home here. Growing your own food is an excellent way to feed your family healthy food on a limited budget. A packet of seeds or even a couple of plants will cost you pennies per pound of food than buying store-bought produce every week. If you are new to gardening and don’t know where to start then you can check out my post 5 Tips for Beginner Gardeners or check out Craftsy’s free online gardening classes. Things will break and kids will outgrow their clothes, so if you’re going to make the most with what you have, you’ll need to learn a few tricks along the way. Buying used whenever possible is a great way to save more and spend less. Kids clothes especially are a good thing to buy used. Check out 6 Ways to Save on Kids Clothes for a list of tips and tricks. Whenever you find that you need to purchase an item it’s best to get into the habit of looking on Ebay, Craigslist or even at thrift stores before you pay full price. Your wallet will thank you. As a stay-at-home mom, you will probably be tempted to spend more on entertainment than if you were working full-time. Resist the urge to enroll in expensive classes and consider going to the park or hosting a play date instead. Make the most with what you have without spending tons of money. Your kids probably won’t even notice. This one goes along with finding free entertainment, but it’s such a great resource that it deserves its own paragraph. Your local library is probably one of the best resource you will find. They host weekly kids classes and workshops. Not to mention you can check out books, TV shows, movies and music for FREE!! So ditch Netflix and dust off your library card. Bartering is a lost skill that should be revived. As a stay-at-home mom, you probably have a group of other stay-at-home mom friends, so why not consider bartering with them? Have each woman make of list of skills (haircutting, knitting, gardening, piano lessons, etc.) and resources (eggs from chickens, access to a boat, abundance of produce from the garden, etc.) to see what you could swap with one another. For example, maybe I could give someone free eggs in exchange for free hair cuts. The sky is the limit so get creative! Programming your thermostat is a great way to save money. For example, you can program it to be cooler at night during the winter and warmer during the day or vise versa in the summertime. Also, learn to open a window or put on a sweater when you get uncomfortable instead of automatically changing the temperature. The more you can DIY the more you will save. As a stay-at-home mom you have a unique opportunity to strengthen your skills and interests. Go to the library, search Pinterest for project ideas or sign up for a free online craft class and learn as much as you can about topics that interest you. The more you know, the less likely you will have to hire someone when a need arises. Keeping your possessions few, your meals simple and your distractions to a minimum is an amazing way to have peace of mind and save money. The less you need, the happier you are. Minimalism rocks. Trying to keep up with the Joneses will never, EVER make you happy. If you aren’t content with what you have right now, what makes you think you will be content with more? The key to happiness (besides knowing Jesus) is being grateful for what you have now and not needing more to make you complete. Need less and you will save more. Hopefully this list has given you ideas and inspiration to save money and make the most with what you have been given. Remember, frugality is a journey and not a destination so do the best you can, but try not to stress if you can’t do it all. 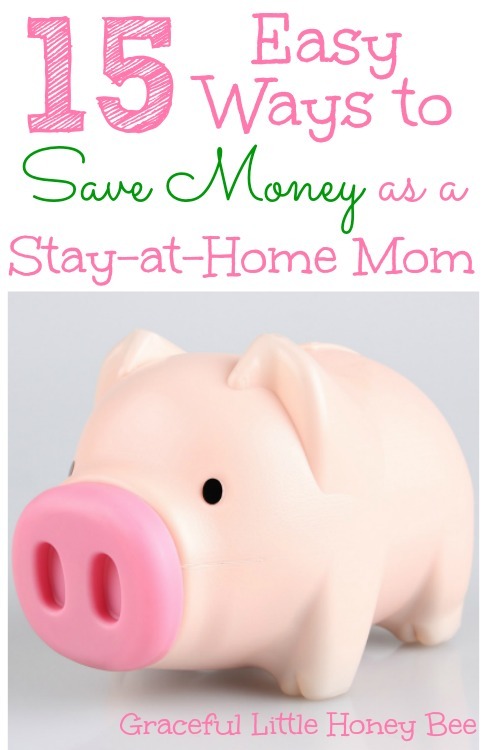 What is your favorite tip or trick to save money as a stay-at-home mom? I’d love to know! Great tips! It is refreshing to see young moms like you and others embracing simple living! I only wish I would have when I was a young mom, but I was in my mid thirties by the time I saw the value of it. We saved a huge amount of money from clothes that were handed down to us from my sister's kids! We also hold an annual garage sale and sell things we no longer use on eBay! We also do a garage sale every year and sell kids clothes at consignments stores. I agree, cash makes a huge difference! Hi Missy I like your site. I would love to be able to use our library for free. Unfortunately in the Netherlands it costs quite a bit for a years' membership. I didn't know about the Craftsy site. Thank you for that tip. Here is one for you: "Future Learn:"internet Introductory courses lasting 2-6 weeks. They are free and the topics are varied. As Hercule Poirot would say, they get the little grey cells working. Love this. I remember having to turn off lights after losing my last job. Cried about the deprivation. This go around, I'm looking from the perspective of global climate change. Everything I'm doing for that is saving me TONS of money. It's the best way for us to help the poorest throughout the world, too.